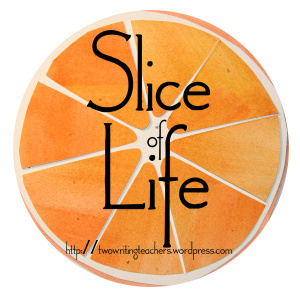 I’ve challenged my 6th graders to a Slice-A-Day during our winter break…I will attempt to keep up with the challenge as well! Today was E’s birthday. He shares his day with New Year’s Eve, and I’d rather celebrate him than a ball drop, a champagne toast, or a countdown. We have celebrated all day. First we looked through pictures of him as a baby and later we had an afternoon with grandparents, cake and gifts. My house is louder than I’d like it to be. Messier too. I clean the counter 800 times a day, and I should vacuum that much as well. There are legos everywhere. My middle son insists on wearing his shoes from the time he wakes up around 6:00, until it’s bedtime. A dishwasher did not magically solve my dish problem. I can’t get laundry done fast enough. I don’t like chores. The bickering just about does me in sometimes… But sometimes you need to focus on the celebration. There are so many things to celebrate. When he is all grown up, I’ll look at him and remember him as a little boy. I hope I can picture him building a lego, with his still chubby cheeks. I hope I can bottle up the little boy snuggles. He’ll be a man, and I imagine he’ll brush away my motherly sad face as I tell him (once again) that he was just born yesterday. Yesterday I had to stop by my classroom to get library books that were due… so I dragged my kids with me intending to to grab to the books and then go home. As we walked down the steps though, the kids started asking if we could stay a bit. Hmmm… possibilities started popping into my head of small projects I could do in my classroom. I told the kids we should get going. They didn’t want to… so I filed some papers, cleaned off my desk, and graded a stray late quiz. Finally they agreed to go. They cleaned up the legos, I grabbed my library books and off we went. As we walked back to the car I realized it had been over 2 hours of no bickering, kids playing together, and getting some of my work done. A Christmas miracle for sure. I’ve never been a fan of the ball drop, countdown, January New Year’s. You can check the tapes– high school parties filmed by a young Mr. Thought. You’ll see people counting down, yelling, hooting. Then he pans to me. I count down a smile on my face, but exasperation in my eye (roll). Trouble is… there’s so much to focus on! the library table that stood in the living room of my childhood house — black-brown with tall thick spindle legs. This is what I think of while I walk the dog today. cozy homes, lamps shining behind partially drawn curtains, warm light, painted walls, carefully arranged furniture, families familying. driftwood pieces, cutting pickles at Christmas, sunlight filtering through drapes, coloring, sledding, laughing with Keely. pizza, sleepovers, falling asleep on long car rides at night — baseball games on the radio, coconut popsicles at the beach, sandy bathing suits. 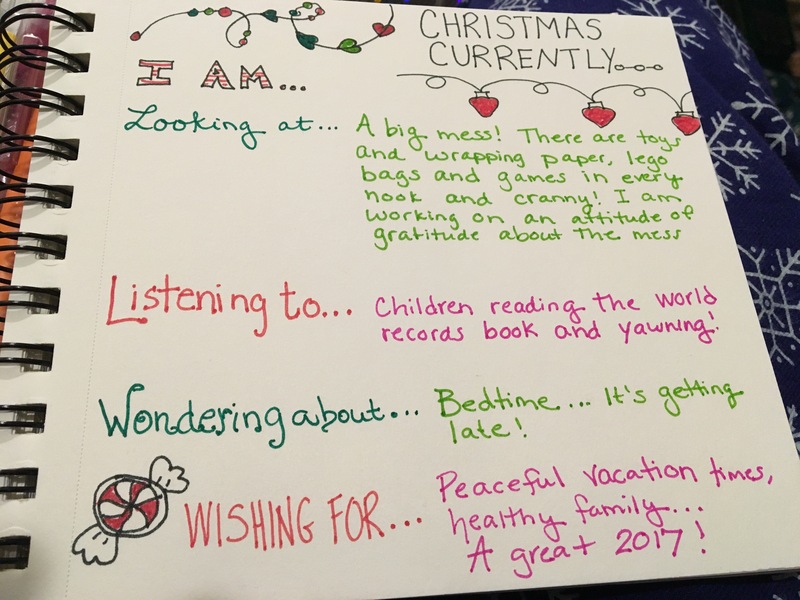 unwrapping presents, anticipation, socks from grandma, pollyanna guessing games, watching Charlie Brown when it came on T.V. walks in the blizzard of ’92 (or was it ’93?) snow days, that day the bus was late and Sara and I had hot cocoa and waited a bit before getting driven to school. hysterically studying with Rachel, wood burning fireplaces, quiet days of reading, my mom telling me to practice piano. someone else making dinner, complaining about doing dishes, having a pink phone in my room, late night whispered calls, movies and popcorn with Greg. that hat that Aunt Cynthia gave me, my dad chasing me down with a bright orange hat, if I forgot to put one one, the way he packed my lunch, the chocolate chip cookies we all ate from the cafeteria. spontaneous trips, road-trip snacks and music, conversations with friends, that time we drove to Florida — switching drivers in decreasing increments of time, trying to stay awake. the way my children look when they are peacefully sleeping, the way my friends tell me it’s okay to appreciate my children most when they are asleep, the way the house is quiet sometimes (rarely). the white round table in the kitchen of my childhood home, the tall chairs, the way we ate bean soup with saltines, childhood. the hat I got for Christmas the other day, my kids opening gifts, my parents visiting, my dog wagging his tail before their car was even visible. Having fun slicing with my new pens! It’s Christmas Eve. My favorite day of the year. When I was young, Santa came on Christmas Eve because we left early on Christmas morning to drive to my grandma’s. Getting ready for Christmas Eve dinner, setting the table, I have always loved the anticipation! I got dressed up. I had the job of slicing pickles and putting them in a little dish with a little fork. I helped set the table. Our Christmas candles were out – santa shapes, I think. The memory is faded, but the feeling is still there…special candles. As my mom’s family arrived, I’m sure I raced to the door to welcome them in — and to check for gifts tucked under their arms. Dinner was in the dining room. The house wasn’t big and the dining room was right next to the living room. My grandpa, his girlfriend, my aunt and my uncle would be there for dinner, and as the only kid at the table, I know I was a little bored and a lot anxious. Every so often I would jump out of my seat to go check if there were presents under the tree. I would shush people when I thought I heard boots on the roof. Dinner felt like years. Suddenly, I would hear bells jingling. I’d jump from my chair and run to the living room. There would be the gifts. Magic. Every year. Magic. Who will be the first to feel 100%? Who will take the lead?